This brilliant film by the creators of the Oscar-nominated 2006 documentary Jesus Camp opens in the Detroit Opera House with a performance of Nabucco—a Verdi work that follows the plight of the Jews exiled from Babylon. Juxtaposed with visual evidence of the city’s exodus—Detroit has lost half its population, and the opera house is itself near bankruptcy—it’s an apt opening to a eulogy for the nation’s most dystopian city. 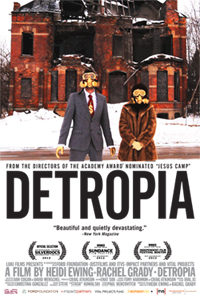 However, in once-vibrant neighborhoods that have turned into overgrown wastelands, Detropia finds grim beauty and a wealth of hopeful lessons for America’s middle class. Among them: Destruction can unleash creativity, if we’re brave enough to let it.